Talk about staring death in the face and coming back even stronger. British 18-year racer Billy Monger returned to competitive racing for the first time after nearly a year since a near-tragic accident saw both his legs amputated. Monger, who raced in a series one step above the series he crashed in (British Formula 3 versus British Formula 4) finished on the podium at the opening round in Oulton Park. Qualifying in fifth place, Monger capitalized on a contact incident between the front runners before settling into third place. Monger’s presence on the British Formula 3 starting grid was only confirmed last week after having carried out pre-season testing. 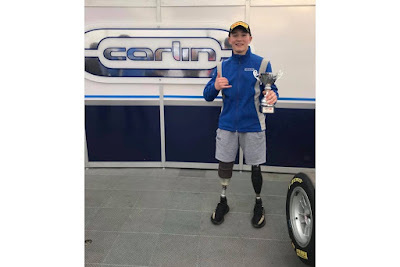 Driving for the Carlin team, his car is specially modified to run its throttle via a paddle on the steering wheel while he uses his right prosthetic leg to operate the brake pedal. Despite his strong showing, Monger says he’s taking 2018 one race at a time since he still doesn’t have funding for a full season of racing. After the accident in April last year, Monger received worldwide support including from Formula 1 World Champion Jenson Button. He raised almost £ 850,000 (~ P 62 million) to go towards his rehabilitation.